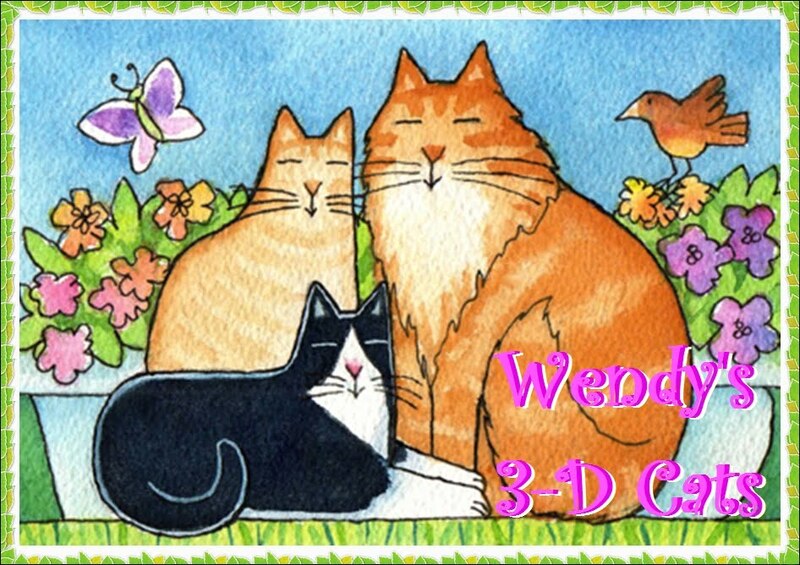 Wendy's 3-D Cats: TUXY TUESDAY WITH DOMINO: SAY 'YES' TO THE DRESS! TUXY TUESDAY WITH DOMINO: SAY 'YES' TO THE DRESS! Domino could hardly wait until today -- Tuesday, that is, so she could wear her brand new summer dress. She has taken a little holiday from modelling lately, but is now back in full FURce! Domino begins by posing prettily in her new dress. "I sai "Yes" to dis dwess! ", she exclaims enthusiastically. The dress is a cotton number in black, white, pink and green -- just like Domino herself! With her pink nose, green eyes and black and white coat, this dress is a true reflection of the wearer. Domino stretches out so you can get the full effect! ... and poses eFUR so demurely! ... she heads for a walk on the runway. She runs into a bit of an obstacle, however. The gardener hasn't finished watering the plants yet. But this gives us another opportunity to see the stunning back of the dress in greater detail. Note the hot pink trim with bow at the waist. It really helps to define Domino's ladylike shape. Domino poses at the entrance to the garden (even though the gardener hasn't gotten around to whippurrsnipping yet). In her floral frock, she is a wonderful foil for this ruggedness, where unbridled foliage meets up with the tame. In truth, this is an analogy for Domino herself. Domino seems tame, but underneath there's a wildcat just waiting to leap out! This little wildcat's had enough for today. Modelling this beautiful attire (as much as she loves it) has tired her out. "I'm gonna wetire fur mai mid-day nap", she says, "an' I'm NOT takin' off mai dwess!" When Domino wakes up, I guess we'll just have to call her "Rip Van Wrinkle"! What a beautiful dress Domino - it compliments your pretty furs. We think you are a natural poser. You look stunning in that floral frock! 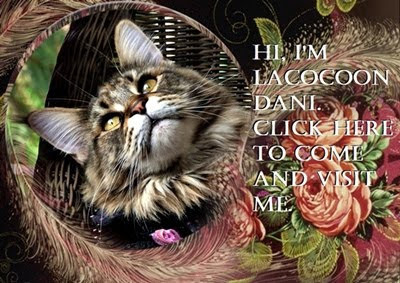 You are the most beautiful cat model! I am in love! That is a gorgeous dress Domino! Hi Dommy, yoo look beautiful! I'm on my way over to stay for the weekend, if that's OK! That's a beeeyoutiful dress! You look so pretty in it! You look totally devine sweet Domino! Domino, your dress reminds us of a flapper girl! We love the colors and pattern...and that wardrobe malfunction...hee hee! I love that the dress matches your colors, Domino! You're always so pretty, Domino, and even prettier in your dress! Hey, isn't it Dylan's birthday tomorrow? I remember he shares a birthday with Samson. We love that garden you have too. We bet you like it a lot. Have a wonderful day, sweet girl! Domino, that is a lovely dress and you look gorgeous in it. Oh, Domino, you are more beautiful in that dress than the flowers in the garden! Oh Domino, you look so pretty! It looks like the perfect outfit for a garden party!